The concert ukulele is considered the best instrument beginners should have in their collections. 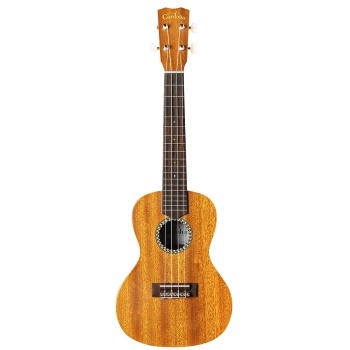 Basically, it is slightly bigger than a soprano ukulele and features more frets with warmer and deeper tone. Although intermediate and professional players can have a go at this instrument, it is often recommended for beginners who want to upgrade their skill level. However, there are so many concert brands currently available on the market, our major goal here is to properly guide you on how to choose the best uke that meets your preference and level of skill. 5 Best Rated Concert Ukuleles Reviewed. 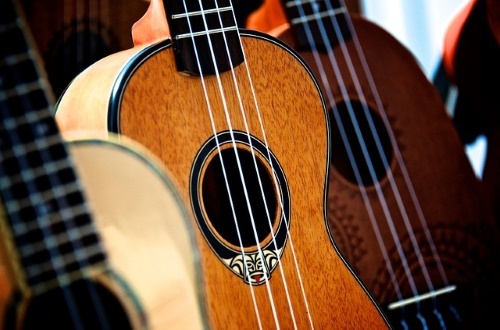 Skill Level – You should know that a concert uke is bigger in size than a soprano ukulele. And it can have up to 20 frets with its strings having more tension. 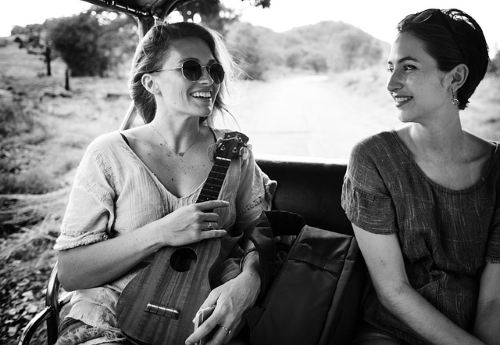 So basically, concert ukulele will be a great option for beginners who want to upgrade on their skill level or who want to play on higher notes than what a soprano uke can offer. Concert Size – Typically, the length of the concert ukulele will range from 15 to 20 inches. This length range is usually ideal for beginners. Concert Ukulele Sound – It is also equally important to know how a concert uke sound. Basically, the concert uke will have a slightly warmer and richer tone than that of the soprano. However, not all concert models sounds great, that is why you need exercise caution when trying to buy one. There is a great chance that you might easily get overwhelmed when on a hunt for a top notch concert ukulele that fits into your budget. This is not far-fetched from the fact that concert ukes are readily abound on the market. But among the multitude of these models, there are still some that offer best value for the money. Our recommended products here are of such quality. 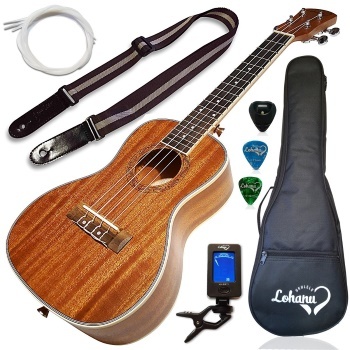 The Concert Ukulele from Lohanu is designed to provide excellent style and exceptional quality that Lohanu is best known for. What sets this apart from the rest is that its entire body is laminated giving it the strength to withstand all types of weather. It is an awesome uke that produces no unsolicited buzzing noises. Overall, this a great uke that has become widely accepted among many users. It is really a decent beginner ukulele. It is quite playable and good enough as a starting point. The Cordoba 15CM Concert Ukulele is creatively built to offer easy playability and elegant appearance. It sports a mahogany side, back and top with a body and fingerboard that are coated with ivory. Its brilliant construction gives it that bright, crisp, and clean tone. Despite some reported intonation issues, the sound of this uke is still very smooth and crispy. It will make a perfect choice for a beginner and enthusiasts. The Hola! 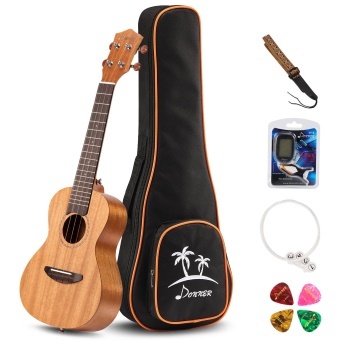 Deluxe Series Concert Ukulele Bundle is built with mahogany body, a nato neck and Rosewood fingerboard and bridge. It features the classical white ABS binding and crafted rosette, which combine well to give this uke an excellent exterior appearance. In summary, this uke is made of one of the finest wood materials in the industry. It will surely offer high quality sound and intonation. Overall, it offers an incredible learning experience. The Luna Tattoo Mahogany Concert Ukulele is designed uniquely from the classical body ornamentation of Hawaii. It possesses a flat mahogany top and neck together with a fingerboard made of rosewood materials. All contribute to the impressive look and sound quality. The laser Hawaiian tattoo design on this ukulele further adds a very unique look to its already awesome appearance. Apart from the cool looking feature, this uke is very lightweight and sounds impressively. The Fender Concert Ukulele is solidly constructed to stand any weather or humidity condition. It features a laminated sides, back, and top. It measures around 29 x 5 x 11 inches which is a bit bigger than soprano but portable enough to carry along during any trip. This uke is really becoming popular well renowned for its portability and the quality of sound. It is perfect enough to entertain a small group of people or at a campfire. Suitable to be your attachee on your next trip. The Luna Artistic Series Great Wave Concert Ukulele is designed with an exceptional artistic touch. It features a mahogany back, sides, and neck with the fretboard made of rosewood. This 23-inch long Ukulele will make a perfection addition to your collection ukulele. Overall, the whole body design is perfectly constructed to make the instrument more portable and playable. The Kala KA-C Satin Mahogany Concert Ukulele is built to offer the quality and durability that people desire in a musical instrument. This cool looking uke is very easy to play with a warm sound. It features a Mahogany neck with a gloss finish. 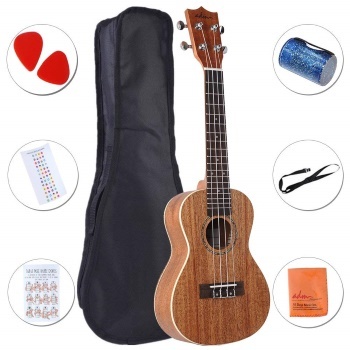 In summary, the Kala KA-C Satin Mahogany Concert Ukulele will come as a perfect choice when looking to buy a beginner uke as a gift for someone. It is really a pretty cool instrument that will never disappoint. The Oscar Schmidt OU5 Concert Ukulele is a brightly made ukulele with natural gloss finish. This instrument is built with the standard traditional wood materials. It features a top, sides, and back that are made of Koa. You can play away at this uke without having to tune every now and then, as it comes with Grover tuning that keeps you in tune consistently. In summary, we will definitely recommend this concert uke for beginners or someone trying to upgrade from toy to something real and solid. It is absolutely gorgeous, you wouldn’t mind coming along with it on every of your trips. The ADM Mahogany Concert Ukulele is constructed with mahogany that ensures its body and neck bring you richer and brighter sound. It features a dustproof die-cast tuners, which provide a slip-free, accurate tuning. Apart from being perfectly suitable for beginners professional players can as well use this instrument. Overall, the ADM mahogany concert ukulele is considerably going to hold up for a very long time. It is recommended for all players most especially the debutants. The Donner Mahogany Concert Ukulele is creatively constructed to offer great sound and easy playability at an affordable price. This uke is adorned with carbon nylon strings that add to its uniqueness and top of the line design. It is definitely a versatile Donner concert model that can be readily played anytime anywhere. Obviously, this uke will be a great practice instrument for beginners. Although the strings that come with it may not be very good, you can easily replace them to meet your preferences. 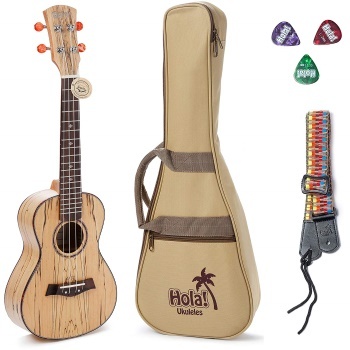 Concert ukuleles are usually very versatile and specially designed for beginners. Although some concert models do offer excellent playability to advanced players, concert ukes are definitely not for everyone. 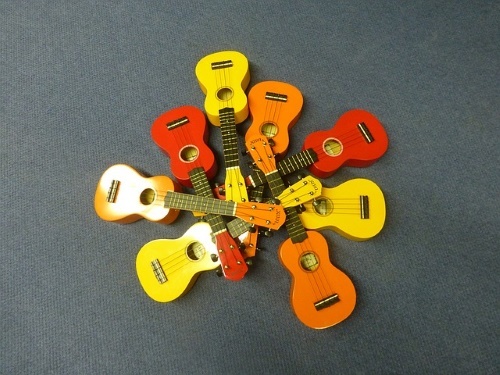 They are a great place to start for new players and those who want to upgrade to a higher level in their learning process will find these ukes suitable. 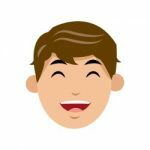 Therefore, if you are considering buying a concert ukulele, going through our list of recommended ukes here will help you in making the best choice.